Upon arrival at the Kathmandu airport, you will be transferred to the hotel. Later, you will check into the hotel for welcome drink. Rest for sometime in the evening and visit a tourist market in Thamel. Stay overnight in the hotel. Post breakfast in the hotel; embark on a sightseeing trip of Kathmandu which includes Pashupatinath Temple (situated 5 kilometers east of Kathmandu, the temple of Lord Shiva is considered one of the most sacred Hindu shrines in the world), Budhanilkantha (one of the largest Vishnu’s stone statues, it is located at the foothills of the Shivapuri Hills. ), Swayambhu Stupa (a historical and old Buddhist monastery in the world and also known as Monkey Temple. 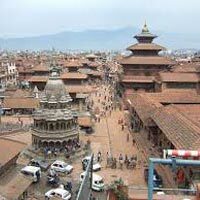 ), Patan Durbar Square (a historical site protected by UNESCO and Kumari Temple) and Kathmandu Durbar Square (situated in the heart of old Kathmandu city at Basantapur, it never fails to lure first time visitors with its group of palaces, courtyards and temples). By evening, return back to the hotel for dinner and overnight stay. Post breakfast in the hotel, check out of the hotel and get transferred to Pokhara by road. Pokhara is well-known for lakes and a popular tour destination in Nepal. It is quite famous as the most beautiful tourist valley of Nepal. The crustal clear reflection of snow-clad mountains on the lake really makes the city dry and adds more features to make it look attractive. Upon arrival at Pokhara, get transferred to the hotel for dinner and overnight stay. Today, in the morning, after breakfast, embark on a sightseeing tour of Pokhara such as Bindhabasini Temple, located in the centre of the religious old bazaar. The temple is dedicated to goddess Bhagwati, another manifestation of goddess Shakti. Then there is Davis Fall, which is locally known as Patale Chhango and in the southern edge of the Pokhara Valley. The famous Gupteshwar Lake is located 2 kilometers away from Pokhara airport. The cave is 3 kilometers long and has some big hall sized rooms and some passages where you’ll have to crawl on all floor. This cave holds a special value to Hindus since a psychosexual symbol of Lord Shiva is preserved here. Then there is famous Phewa Lake (it is the second largest lake in the kingdom) and Barahi Island Temple, which is located in the middle of the lake and considered as an important religious monument in Pokhara. There is also a regional museum, located on the road to Mahendra Pul, which is devoted to the history and culture of the Pokhara Valley. Not to forget Mahendra Cave, which is an unrightfully a habitat of bats and provides adventurous time for the tourists.Built entirely of limestone, this cave offers artificial lighting systems. By evening, return back to the hotel for dinner and overnight stay. Post breakfast in the hotel, you will be transferred to Kathmandu. On the way, visit Manokamna Devi Temple nestled atop of a 1300 meter hill, encompassed by a small village community in Gorkha district of Nepal. The Manakamana Devi Temple is a highly venerated sacred place of Hindu goddess Bhagwati. Its name has been derived from two words- Mana means the "Heart" or "Soul" and the Kamana means "Wish". It is believed that the goddess fulfills the wishes of the people who worship her with good intention and pure heart. This temple has a tradition of sacrificing animals. The cable-car takes only 10 minutes to cover 2.8 kilometers distance. 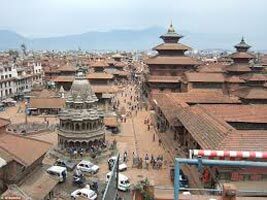 Upon arrival at Kathmandu, check into the hotel for dinner and overnight stay. Post breakfast in the hotel, you will be transferred to the airport for departure back home.